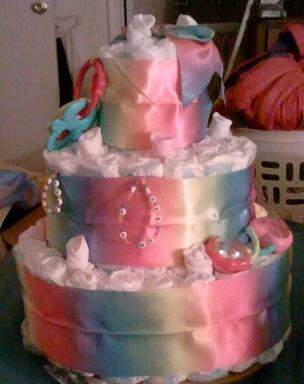 What do you see when you look at this cute rainbow diaper cake? Cute ribbon? Cute colors? All the love that went into making it? All of the above!! 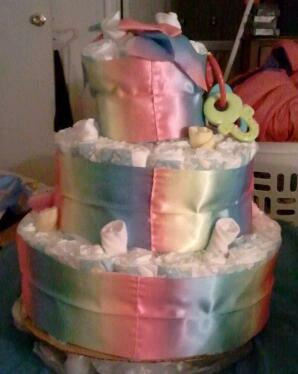 We thank Tammy for sharing her cute diaper cake with all of us! Tammy is paying it forward to thousands of others by sharing her ideas and her photos. Our diaper cake gallery is the marvelous result of hundreds of our readers who have submitted their diaper cakes. We love each one of them! Thanks so much, Tammy! 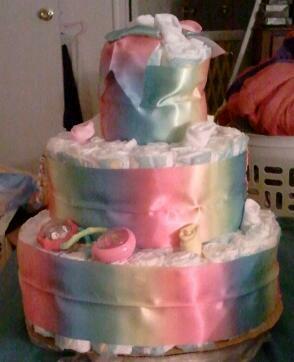 Add your diaper cake to our delightful gallery by submitting your diaper cake right here! 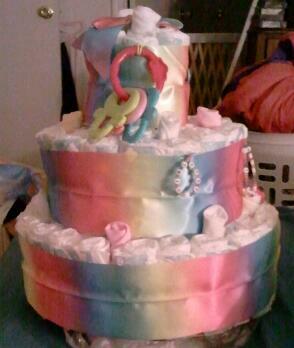 I made this diaper cake with 3 layers. Bottom layer has 4 rings, middle layer has 3 rings, and top layer has 1 ring of diapers. *Needle and thread,glue dots, or hot glue gun ( to secure binding around layers) ( If you sew remove first, tack wrong side out, once done replace right side out.